Wonderfully chic pair of Tom Ford for Gucci boots from the 90s. Black patent leather with an easy to wear mid-height block heel. Condition report: great pre owned condition, no cut or tears, both zippers work fine, perfectly wearable. Gucci leather block heel ankle boots featuring web striped paneling. Style Number: 432038. Fabric Content: Leather. Color : Brown. LGS market experts authenticate, price, describe, and photograph every item, making it a truly simple and genuine experience. RFID AUTHENTICITY CODE ON BOX!!!! 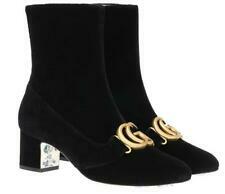 NEW WITH BOX AND DUST BAGS GUCCI LADIES FABULOUS ANKLE BOOTS FROM CURRENT COLLECTION. MADE IN ITALY. 100% AUTHENTICITY GUARANTEED. LUXURY QUALITY BLACK COLOR VELVET, 100% LEATHER FULLY LINED. 2' COMFORTABLE HEELS. SIDE ZIPPER CLOSURE. SIGNATURE DOUBLE G LOGO DETAILS. 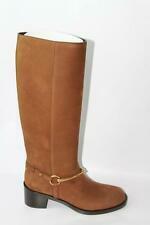 Gucci Guccissima Monogram Canvas Boots. 2.25" kitten heel. Calf Circumference: 14". Canvas uppers. Leather lining and sole. 000029 0500. Great condition! This is a stunning pair of boots, and they are just plain gorgeous. 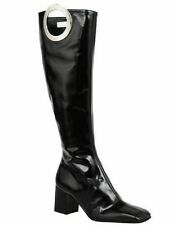 NEW WITH BOX AND DUST BAG GUCCI LADIES KNEE HIGH BOOTS FROM CURRENT COLLECTION. MADE N ITALY. LUXURY QUALITY BLACK COLOR 100% LEATHER BOOTS, SIDE ZIPPER CLOSURE, GOLD TONE SWAROVSKI CRYSTALS EMBROIDERED 1.5" COMFORTABLE HEELS.